Two new hand tools that are designed to offer superior comfort and control for people making chainmaille and other jewelry involving a wide range of jump ring sizes are being introduced by Xuron Corporation of Saco, Maine. 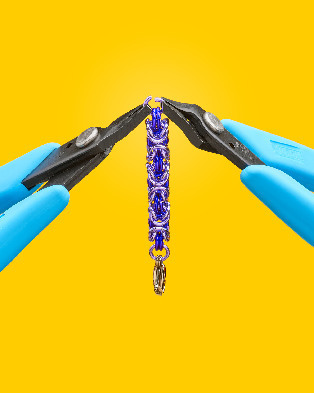 Xuron® Chainmaille Pliers are designed to let artists hold and manipulate jump rings of all sizes including tiny (micromaille) and rubber rings with superior comfort and control. Brand new is the Model 483 Short Flat Nose Pliers with smooth 3 mm wide jaws for a secure, non-marring grip. This tool is ideal for use with their Model 487 Chisel Nose Pliers which have a 45 degree angled jaw for holding a ring without obstructing the open space. Made of high carbon steel with an eye-friendly glare eliminating black finish, responsive return springs and Xuro-Rubber™ cushioned hand grips, Xuron® Chainmaille Pliers were especially developed to let artists effortlessly hold and manipulate delicate jump rings. The Model 483 is for jump rings up to 14 AWG and the Model 487 is for rings from 20 to 14 AWG.